Guys, let’s talk pain shall we. I have so many patients that come in with knee replacements, hip replacements, in need of replacements, or just living in pain. I feel that between acupuncture and adjustments in body mechanics, all of this could be avoided. Let me explain. Joints sit a certain way. The knee for instance must track a certain way when it’s moving. But, when certain muscles are weak, or too tight, or fascia is stuck to the muscle, it prevents the knee from tracking properly when it moves. The knee then starts wearing away at all of that nice juicy padding built into the knee. Then, the knee starts to rub bone on bone. The bone starts to get all jaggedy. All through this process inflammation starts, discomfort comes and goes, then stays for good, discomfort turns into pain, and inflammation continues to get worse. Then what you have left is a painful, worn down joint in need of replacement. My solution is to stay on top of this. Prevent this from happening. Once the bone looks like a gnarly mess, you’re sort of done. Fix the muscles and tissues around the joint, get acupuncture to increase qi and blood flow and reduce inflammation. This allows the joint to heal. So, don’t just pop anti-inflammatories and pain killers and continue destroying your joints. Fix the root of the issue. 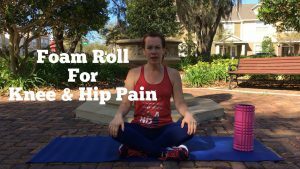 In the video, I show you two exercises that I do to release the tissue around the joint that prevents the knee and hip from functioning properly. You can do these on the living room floor, while you watch your favorite show. It only takes 5-10 minutes a day to regain and maintain mobility. Click here to watch the video. In coming weeks I’ll go over more of these exercises that you can do to release muscles and connective tissue, so that you can regain flexibility, mobility and proper joint function. Be sure to subscribe to the newsletter &/or the YouTube channel so you don’t miss upcoming videos. If you are interested in getting a foam roller check these out… This is the foam roller in the video, This is the foam roller I use at home. Let me know what your think or if you have any questions. This entry was written by Dr. Shelly Masters , posted on Wednesday March 08 2017at 08:03 am , filed under Uncategorized and tagged adhesions, fascia, fascial release, flexibility, foam rolling, hip replacement, knee joint, knee pain, knee replacement, mobility, physical therapy, trigger points . Bookmark the permalink . Post a comment below or leave a trackback: Trackback URL.